The purpose of the test is to control the mechanical stability of the fixing of Thermostats in ELECTRICAL IRONS according to IEC 60335-2-3. This is carried out with drop fall down test of the electrical iron on a steel sheet with a mass of 15 kg. The electrical iron falls down from a height of 40 mm. The Universal Spring Impact Hammer is specified in IEC 60068-2-75 for impact testing. There are single energy hammers from 0,2 Nm to 1,0 Nm. 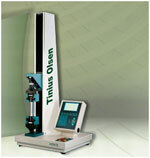 Also an Universal Impact Hammer that you can preset to any impact value between 0,2 Nm to 1,0 Nm. This offers a very universal use when testing. The Spring Operated Impact Hammer simulates mechanical impact to the surface of the enclosures of electrical appliances and components.